Please refer to our stock # 1812pr when inquiring. Gilt, hand carved frame. Part of cartouche on one frame is missing. 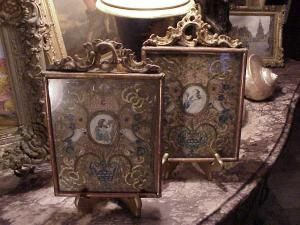 Paintings on vellum and gilt embroidered. Parrot design. Back in excellent condition. My sense is that both paintings were done by the same artist. One depicts an artist painting a Madonna and child. The other is a painting of lady drinking from a cup with a serpent popping out. May have importance as reliquaries. 7" x 11"